Rider gave me the tools I need to be successful. I felt very prepared to start my teaching career. As an education major, he was excited to learn his classroom experiences would begin during his sophomore year. “That was very important to me. 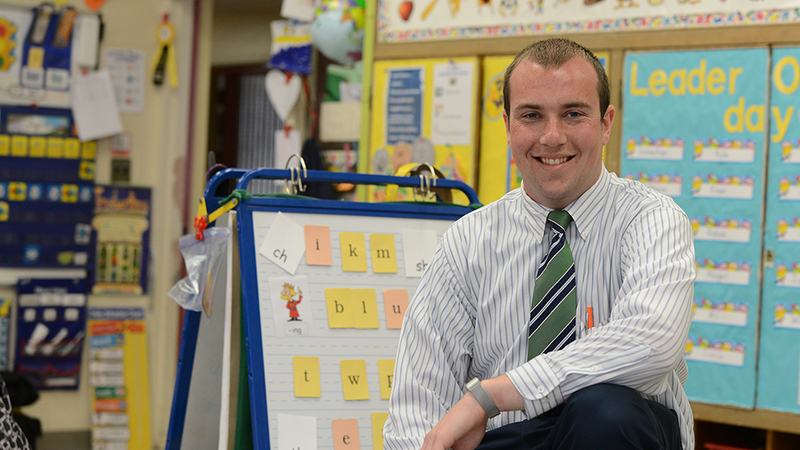 I didn’t want to wait until I was a student teacher to get into a classroom,” he says. David also was intrigued by Rider’s short-term study abroad program and the many opportunities it offers students to become involved on campus. By the end of his sophomore year, David had completed two practicums at elementary schools, including a special education internship focused on students with autism spectrum disorder. He went on to complete two additional practicums and a student teaching assignment over the next two years. “That hands-on experience was invaluable to my career,” he says. David’s many leadership activities included Rider’s Student Education Association (SEA) and Council for Exceptional Children. As a student leader, he helped secure annual transportation funding for education majors to attend a state convention and worked with the SEA executive board to host the nation’s first student-run EdCamp on a college campus. In addition to earning a Certificate in Leadership, David was honored with the prestigious 2018 Leadership Legacy Award from Rider’s Center for the Development of Leadership Skills in recognition of his efforts. Two months before graduation, David was offered a full-time position as a special education teacher at Millstone River Elementary School in the West Windsor-Plainsboro Regional School District — the same school where he completed his junior practicum in Spring 2017. “It was such a relief to be hired so early. I felt like all my hard work paid off,” he says. When he went to sign his contract, the district supervisor said they needed a substitute special education teacher at Grover Middle School. David started that job immediately after graduation and worked through the end of the school year in June. “It was such a great learning experience and a great start to my teaching career!” says David. Throughout his four years at Rider, David worked for the Admission Office as a campus tour guide. He also worked three years as a student assistant in the Office of the Dean in the College of Education and one year as an orientation leader. David double majored in elementary education and psychology. He also minored in special education and earned certification as a teacher of English as a Second Language (ESL). “I always wanted to be a teacher. I have a passion for special education and I want to make a difference in the lives of children and their families,” he says. My professors inspired me. They passed on a passion for teaching and an individual focus I’ll carry with me into my own classroom.